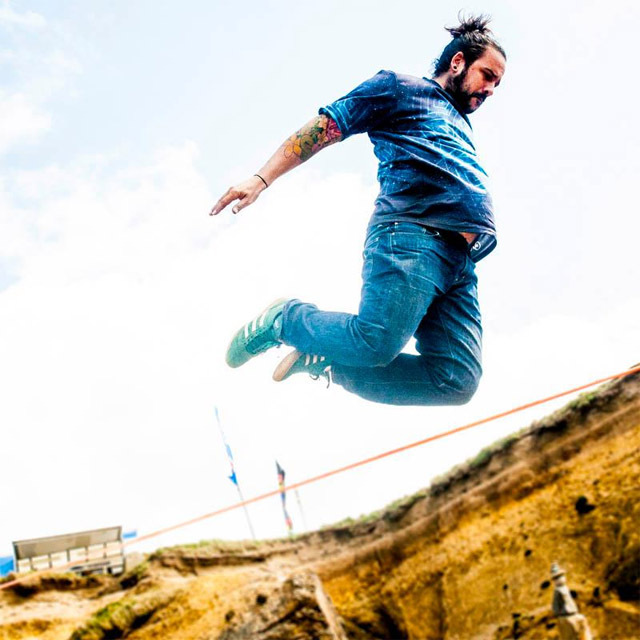 You may have seen that Aquajuice have been running a competition where you can win a Maverick slackline kit, the competition is still running so head over to the Aquajuice website for a chance to win! 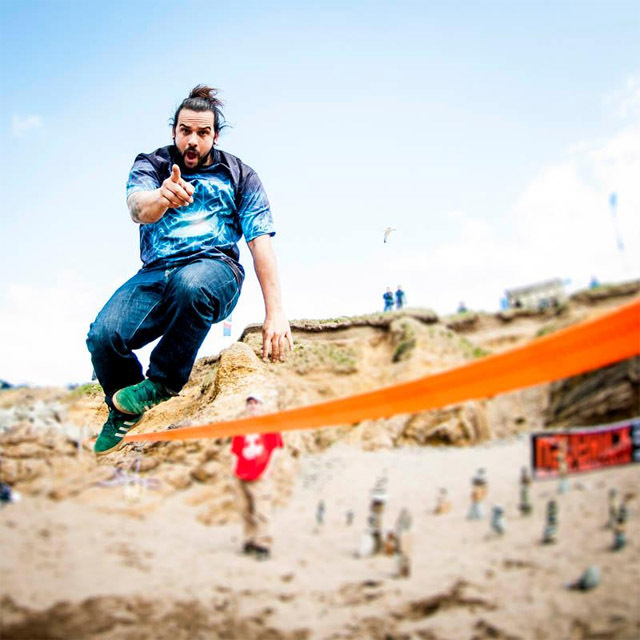 Well, last weekend we joined our friends from Aquajuice and Surfing GB at the ‘Calypso British Schools Surf Championships‘ to provide some slackline fun for the talented young surfers between heats. 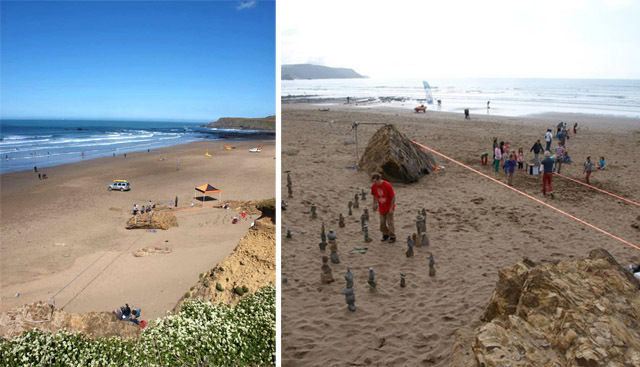 The venue for the champs was the beautiful Widemouth Bay in Bude, Cornwall. We were blessed with beautiful weather and good surf and the stage was set for a great day. Russ, Ian and Ryan were there to provide some demonstrations and workshops. By virtue of the picturesque Cornish coastline we were able to rig several Maverick lines using natural rigging techniques, wrapping the large boulders along the beach. It’s rare to find such a great natural slackline spot and we’d recommend it to anyone, just take plenty of spansets! We had to remove a lot of large pebbles from the sand around the lines and decided to have a bit of fun with them, creating a zen balance garden and encouraging people to contribute their own rock sculptures, which went down really well with everyone and made for quite a beautiful addition to our area. 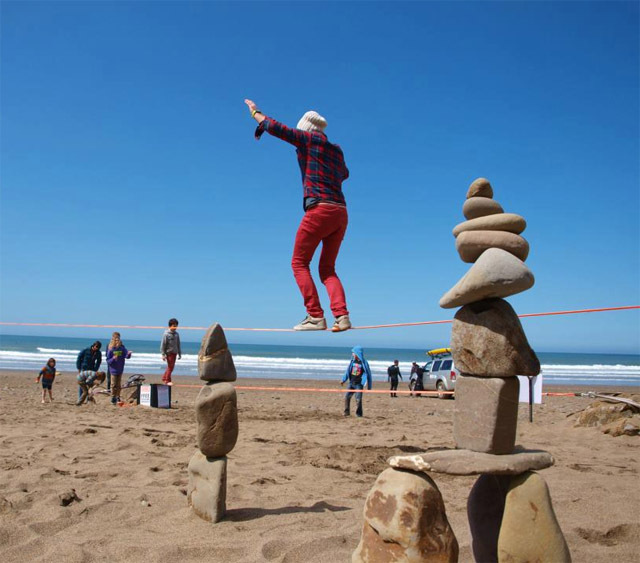 Loads of the young surfers came and enjoyed the slacklining, some more successfully than others! Quite a few really got hooked and spent the whole day with us. It was inspiring to see some of the talented youngsters pick it up so quickly, confidently walking the length of the line after just an hour or two. The judges and the MC all came down to have a go, quickly realising that it wasn’t as easy as the Maverick team or some of our new friends were making it look! Thanks to Aquajuice and Surfing GB for inviting us along!